When Renata Scotto made her début in I vespri siciliani at La Scala to open the theatre’s season on 7 December 1970, one of the singers that she admired the most was in the theatre. Maria Callas had opened the season with the same opera 19 years previously, and was now sitting in the box of the theatre’s Director to hear Scotto. Callas hadn’t sung at La Scala since a Medea in 1962, so when fans saw her they went wild with cries and applause, an applause that continued at the artists’ entrance afterwards. Although Callas didn’t encourage this, Scotto took affront at the spotlight being taken away from her, and left a very angry interview with a popular ‘gossip’ rag, Stop. It certainly wasn’t in good taste – Callas didn’t behave like a true lady. But what do you expect, when you have nothing left in your life and you’ve passed your peak… you take gratification at whatever cost, even if it means just a few stolen crumbs and so without value. What Callas was supposed to have done, Scotto doesn’t make clear, and short of leaving the theatre there was little for Callas to do to quell the ovations. Some said that Scotto broke into tears in her dressing room after the performance. I didn’t give in to nerves because if I’m a good and sweet person in my day to day life, on stage I’m a tigress. No, I didn’t cry, but only because I summoned up all my willpower. I knew that that was what Callas and her zealous fans wanted. They tried to cause me problems with a rude and stupid act, but they failed, I didn’t give her or them that satisfaction. I finished the performance without losing control and I think I sang very well. For that matter, the critics too confirmed my success. After the opera, I was invited to attend a party that Callas had organised, but I didn’t go. I was very angry, and I still am, because I find it completely unjustifiable and unworthy of a respectable person. Callas had apparently sent flowers to Scotto’s dressing room, and stood up to applaud her at the end of the opera. Scotto seemed convinced, however, that it was organised in some way. In the heat of the moment she gave ‘that’ interview, something which she has tried to play down ever since. It was reported that paparazzi burst onto the stage after the curtain had fallen to photograph Callas while ignoring Scotto. No, they didn’t go that far. If they had, I would have thrown them off stage myself. I was the mistress of the stage at that moment and, as I said, when I’m on stage I am transformed, I become a tigress and I won’t be pushed around by anyone in the world. I don’t like high-society, I don’t spend time with famous millionaires, I don’t do strange things… I am a peaceful woman, I love my family and when I lose my voice I will retire without bad feeling, and become a happy housewife. But as long as I am singing I demand respect as a serious artist, who is well-prepared and ready to give everything to her public. I took a year to prepare for I vespri siciliani… a year to study the score and the character, because I’m convinced that it’s not enough just to sing an opera but necessary to interpret it. Callas was hoping to harm me but she didn’t succeed. In fact, I would have loved for her to come on to the stage and sing I vespri for me… I wonder what she could have done, poor thing! Nowadays she doesn’t sing anymore and maybe she believed that it was possible to revive her success in this wrong and rather pathetic way. I’m sure that she would have loved to have been in my place, but not having the means to do so she was content to act out that little show from her box… those who were cheering her on were probably the same who several years ago, again at La Scala, threw vegetables at her. Perhaps Callas needs this ‘stolen’ applause because she has nothing else left… no husband, no man who loves her, no child… I am so much richer than she is that I can let her have that applause, if that’s all she has left in her decline… poor thing! She was the genius. Genius comes from genio — spirit. That makes her greater than all of us. Apart from a recital 15 years later, Renata Scotto never appeared again at the Milanese theatre. Callas returned just once more, in 1972, to hear Giuseppe di Stefano in Carmen. Certamente non è stata una cosa di buon gusto, la Callas non ha certo tenuto un atteggiamento degno di una vera signora. Ma cosa vuole, quando nella vita non rimane più nulla e si è sul viale del tramonto, capita di volersi prendere delle soddisfazioni a tutti i costi, anche se poi in definitiva si tratta di briciole rubate e quindi di ben misera cosa! Non ho ceduto ai nervi perché se nella vita sono una donna dolce e buona, sulla scena sono una tigre. No, non ho pianto, ma soltanto perché ho fatto appello a tutta la mia forza di volontà. Ho capito infatti che era quello che sia la Callas sia i suoi fanatici fans volevano. Hanno cercato di mettermi in difficoltà con una maleducata e stupida azione, ma non ci sono riusciti, non ho dato né a lei né a loro questa soddisfazione. Ho terminato la mia esecuzione senza perdere la calma e credo di aver cantato molto bene. Del resto anche le critiche hanno confermato il mio successo artistico. Certo, dopo teatro, mi avevano invitato al ricevimento che la Callas ha dato, ma non sono andata. Ero molto seccata e lo sono tuttora perché trovo che tutto ciò sia assolutamente inqualificabile e indegno di una persona per bene. No, non sono arrivati a tanto. Sc lo avessero fatto davvero Ii avrei buttati giù io stessa. Sul palcoscenico in quel momento ero io la padrona e, come le ho detto, quando sono sulla scena mi trasformo, divento una tigre e non mi faccio mettere i piedi in testa da nessuno al mondo. Non amo la mondanità, non frequento i miliardari famosi, non faccio cose strane, sono una donna pacifica, amo la mia famiglia e quando non avrò più voce mi ritirerò senza animosità, diventando una felice donna di casa, ma sino a quando canterò esigo che sia rispettata la mia personalità d’artista seria, preparata e che sa dare tutto al proprio pubblico. Per preparare i Vespri Siciliani ho impiegato un anno, un anno di studio della musica e del personaggio perché sono convinta che un’opera non basta cantarla, e necessario anche interpretarla. La Callas sperava di danneggiarmi ma non ci è riuscita. Del resto avrei proprio voluto che lei scendesse al mio posto e cantasse i Vespri per me… chissà poverina come avrebbe potuto farcela! Ormai non canta più e forse ha creduto di poter rinverdire il successo in modo tanto scorretto e anche un po’ patetico. Sono sicura che avrebbe voluto essere in scena al mio posto, ma non avendo più i mezzi per farlo si e accontentata di recitare quello “show” inopportuno dal palco… quelli che la incitavano a gran voce sono del resto quasi certamente gli stessi che alcuni anni fa le hanno tirato, sempre alla Scala, ortaggi sulla testa. Ma forse la Callas ha bisogno di questi applausi rubati perché non le è rimasto altro… non un marito, non un uomo che la ami, non una figlia… sono tanto più ricca di lei che quegli applausi glieli posso anche lasciare! Se è tutto quello che le rimane sul viale del tramonto… poverina! Thank you for this. I was in Vietnam at the time and only heard bits and pieces. Thank you for filling in the very colourful blanks. Very interesting, especially for those of us old enough to remember both, but what about the awful jealousy La Screech-o displayed against Callas long after her death in the tv Zeffirelli bio-pic some years ago? “Why she do this to me?”, I seem to recall her fuming. Callas, of course, did nothing except be there, The rest just happened around her. Scotto was a fine singer before she slimmed physically and went into vocally heavier roles. I found her Lady Macbeth at the Met and Covent Garden quite painful to the ear. Perhaps her above outbursts are why Callas declined to give me an autograph at Mirella Freni.’s debut Violetta in the premiere of Visconti’s Traviata in London in 1967 (? ), inviting me instead to her hotel for it the next day. I of course complied. I think not: Vespri was ’70. Freni’s ’67 Violetta disaster at Scala could therefore not be the cause. It was three years earlier. Freni – a disaster? Yes, it was the one and only role: first at Scala under Karajan and then under Guilini at Covent Garden. Deluxe opportunities indeed. IMHO it was lack of temperament. EMI actually filmed the CG performance but it was never released. Mysteriously it appeared on You Tube for a few days before Freni and EMI had it removed. Her film with Bonisolli is good however. What did you think? Wow- This is why I rarely make friends with Divas, male or female- so temperamental- I wonder if MS Scotto ever attempted to apologize for this childishness- I would like to think that MS Callas would have been more gracious if the situation had been reversed. Thanks for the interesting article. Love history of the arts that shows the human side of artists. 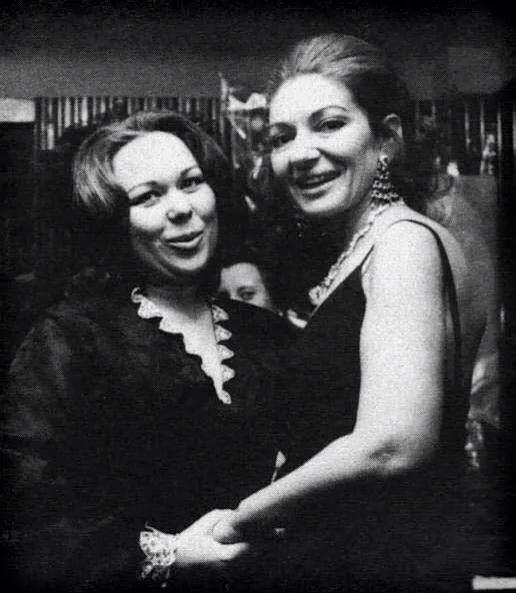 Perhaps Callas should have been politic enough to go on the second night thus giving Renata her night of glory. On the other hand Callas may have wanted to gauge the strength of her own popularity with the public. Peter’s comment about Renata and her weight could also be applied to Callas as her singing also became painful to listen to. I would not agree with that, Marcin. There were flaws, yes, but it was not as bad as that, and always had a unique flavour which made it instantly recognisable. That, coupled with her stage presence, accounts for her star quality, in my opinion. While I admired Callas very much she was not my favorite soprano voice, I have heard that Scotto could be very nasty at times, which is proven by these vicious and stupid comments about Callas. No wonder La Scala never had her return. Scotto was sort of a queen at the Met, from what I heard, was due to her defense of James Levine who was in some legal trouble at that time.